ORDER AS MUCH AS YOU LIKE AND PAY JUST ONE STANDARD DELIVERY COST. The majority of our parcels go out with FedEx, standard delivery times are between 9am - 6pm. Please note we do not deliver on weekends or bank holidays (unless Saturday pre noon delivery is specified). For orders outside of mainland UK please allow an extra working day for the parcel to arrive. Delivery prices shown on this page apply to all Website Orders and Phone Orders placed with our Websales team. Orders placed with our Corporate & Trade Departments may have different delivery costs. Please note Free delivery and any other promotions that may be running do not apply to Trade or Corporate Orders. Please speak to our Trade Sales team for more information. 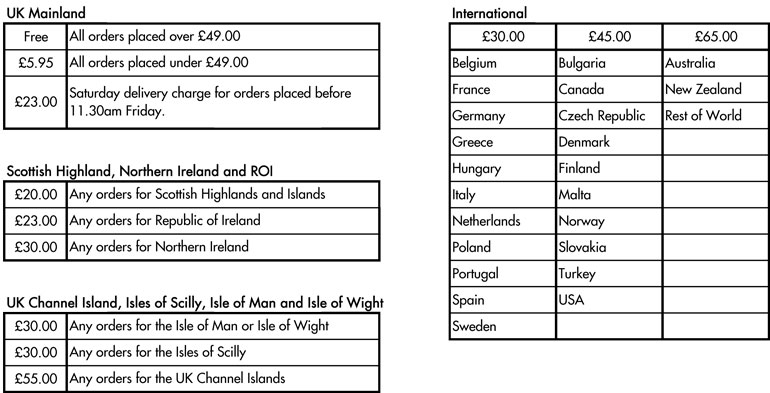 Sale items can only be delivered to UK Mainland addresses. Please be aware that any orders requiring images being engraved will be quoted on an individual basis. Text only engraving can usually be carried out under the standard delivery times. If this is not the case a member of our web sales team will get in touch with you. Dartington Crystal pieces can be delivered Internationally with ease, with just one postage charge per order*, what's more, if the shipping address is outside of the EU we can remove the UK VAT making your gift even more cost effective. Please note if outside the EU, your countries Duties and Taxes are not included in the delivery rates and can be billed to the recipient upon delivery by the courier. Therefore please check your countries Tax and Duty terms before placing an order as the purchaser is liable for any import duties or local taxes that may apply. *Please note should the delivery cost incurred by Dartington Crystal from the courier be greater then the actual delivery charge of your own order we will need to contact you and potentially cancel the order if it is not viable to dispatch. All prices on this website are shown with UK Value Added Tax included. If the shipping address is outside the EU, we are able to deduct the Tax at the check out for you automatically. We do deliver to British Forces Post Office addresses. The charge for BFPO delivery is £5.95, this covers the cost of delivering your parcel to the BFPO sorting office. Please note that the facilities at the BFPO are restricted to Service personnel, entitled civilians and their dependents serving in the HQ, its outstations and the local British Embassy. Please select our Standard UK Mainland Delivery £5.95 service when purchasing through our checkout pages on this website. Proof of delivery is not available with this delivery service. Please also note that certain areas carry specific weight restrictions and parcels over these weight limits are automatically returned to us. For further information on deliveries to British Forces postal addresses please visit https://www.gov.uk/bfpo.